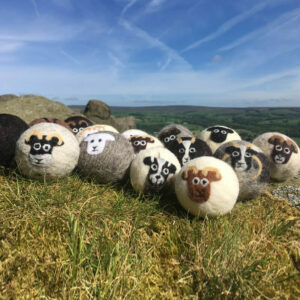 Pack of 3 Wool dryer balls, felted laundry balls, reusable, chemical free laundry, natural fabric softener. Made from 100% sheep wool to the core, there’s no wrapped yarn filling, so these hardy types won’t unravel in the tumbler. In fact they’re good for literally 1000s of spins. Like the best of sheep, they may need a trim from time to time to return keep them looking good. Their lanolin content also makes them an ideal chemical-free alternative to softeners and disposable laundry sheets. My little ones’ nappies (always the ultimate test I think) came out soft, fluffy and free from any of the residue softeners can leave behind. That’s not to say you can’t add a little fragrance if you want to.